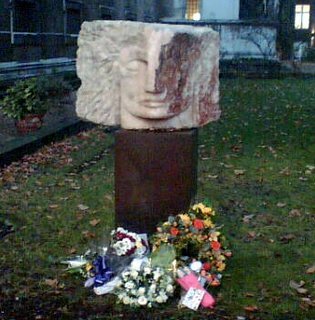 Photo shows The Wounded Angel of St. Pancras church, dedicated to the victims of the 7th July bombings, and flowers underneath left by some of the passengers of the 8.50am Piccadilly line train 311 that was suicide-bombed, ( 'Kings Cross United') the staff of Russell Square and the British Transport Police officers who rescued the passengers, and the drivers of the train. Yesterday, we all met at Kings Cross station at 3.30pm, carrying our flowers and trying to look inconspicuous, fearful of the media. There were about 30 of us. We were fortunate, the press and TV cameras had all gone to a 7/7 Remembrance ceremony at the Cenotaph, organised by People In Common I think. At least, that was where I suggested ITN went. We did not want publicity, and they did, so it worked out well. At Kings Cross, we met Ranesh and Allen from LU, who explained that they had cordoned off a part of the Westbound Piccadilly line platform for us to say the words I posted in the entry below. We met up with David, the station manager of Russell Square, who ran into the tunnel to rescue us, and Tom and Ray the drivers of train 311, and Steve and Gerard the police officers who conducted the rescue & evacuation operation of the passengers entering from Kings Cross. All are now members of KCU. And we are very proud to have them in the group. After a scare about football fans surging noisily and aggressively out onto the platform, we all went down. Even going down the escalators was emotional. Some of the group had not been to that station, or that platform since July 7th. We stood, protected by LU staff, right where the bomber and the 26 passengers who died had boarded the train. We read out the words, and we said together how 'We hold you in our thoughts'. We held our flowers. Many of us wept. Then we left the station - still protected by the LU staff who were very kind - and we walked to the Parish Church of St.Pancras, where we were met by the vicar, Paul Hawkins who led us through the church to the garden where there was a statue in memoriam of the victims of July 7th. The statue was called the 'Wounded Angel' - a calm face carved in ( I think) quartz, wings suggested behind, the other half of the profile still unhewn and so appearing shattered. Here we left our flowers and wreathes, and we repeated the' We are all fellow-passengers' meditation. I left 26 roses, one for each person who died. We spent a little time in the church, sitting in pews and thinking or praying. Then we went to a pub on Euston Road. It felt for me, and for many, like a release of something, something that had needed to be done, that ceremony, standing together. I felt better afterwards. Afterwards we went to a different pub in Islington, and had dinner together. New members, and people I have known since July, all laughing and chatting. We'll meet up again in February. One of KCU took more pictures; on our website there is now a gallery, carriage by carriage, of smiling faces from the train. We are lucky to be here, lucky to have each other, when we read out the list of the dead yesterday, when I spent yesterday morning re-reading about their lives, linking them on the blog, looking at their glowing, smiling, hopeful faces, I was so struck that it could have been any of us. The bomber hated us all, he didn't care who died, he wanted to kill as many as he could. The more I know of people from my train, the more I look at strangers - anyone - and see in them a fellow passenger on a journey. One man on a train with hate in his heart and a bomb on his back, seeking to divide and kill, versus dozens of passengers drawing together, caring for each other, comforting each other, remembering the dead and injured and bereaved - and celebrating life with new friends. Out of such terrible darkness, light has come. UPDATE: You can read fellow-passenger Holly's account of the ceremony here. And thank you for the picture of the Wounded Angel of St.Pancras with our flowers left underneath, Holly. I was very honoured to be contacted by the New Zealand family of one of the passengers, who said that it meant a lot to know that their lovely daughter was commemorated by her fellow passengers six months on. The bomber hated everybody, maybe including himself. In my belief system, such a person does endure hell. But eventually they are allowed to reincarnate, hopefully having learned their lesson. I don't believe in eternal hell, although sometimes I feel that certain people deserve it. It looked like a very touching and emotional day for everyone. Sorry I couldn't make it in the end. Totally regretted being a stay in bed sap yesterday. Our service went well, it was very moving. We used some of the words that you were using for your service, in solidarity with you, and also we used some of the words from the service held in St Pauls in November, and we rang a bell for everyone that died that day. So while you had your private service, we had a public one that reflected what you were doing privately. And yes, the media did attend, in fact there were more of them than us. To be honest they were quite cynical [indymedia journalists excepted of course] - seemingly only interested in numbers, whether the bereaved were going to be present or whether there were going to be any arrests [which, thankfully, there weren't]. This left a nasty taste in my mouth, but overall I am very glad we did it: as I said, it was very moving and also perhaps we were a deflection for your well deserved privacy. Incidentally, some of us are wondering whether to hold another service on the 7th February, for the 7 month anniversary, this time at same time as the bombs went off in the morning [it will be a week day] but also this time in front of Downing Street and with a specific request for a full public enquiry into the reasons behind the bombings. But we are not sure about this because of the sensitivity of the subject. We are keen to promote a good cause, but would not want to appear to be insensitive. And so I was wondering what you and others who were directly affected by the events think of that idea. by the modern western world are addressed, there will always be the threat of terror and/or anti-establishment violence in our midst. So we think a wide ranging and truly independent enquiry might go some way in exploring and bringing to light these legitimate grievances so that the deaths and injuries that took place that day are not in vain. This is of course not to condone terror in any way, but rather to recognise the existence of factors that cause people to feel a sense of injustice and to want to commit acts of terror. Would be very interested to know what you and other members of Kings Cross United feel about this, as I am well aware of the sensitivity of this subject and would like to proceed in an appropriate manner. Also, did you know that Saturday would have been the 28th birthday of Jean Charles de Menezes? A strange coincidence that I just discovered. "Seeking to divide and kill" - Didn't work did it? All the best to all of you. What a terribly insensitive thing to say. I'm glad it went well, Rachel. sorry...why is that insensitive? i was just saying to yorkshire lass (who i know as a fellow KCU member) that we missed her at our ceremony on sat & i'll see her next time we meet up. I'm glad your ceremony went well and thank you so much for being our much needed press decoy. We had a very moving and lovely ceremony at Kings Cross on the platform. We all laid a lot to rest I think. I am completely behind you with your demands for a public enquiry. I also agree that we need to work really hard to cross the divide between the modern western world and the international muslim community. That is the only way forward. Obviously I'm not speaking for Rachel here (we all know she's perfectly capable of speaking for herself! ), I am speaking as a fellow passenger. I fully support you in all your work to keep this issue in the public eye and would certainly be keen to join you. Speaking personally however, if our demands were to be marked every month by a service of rememberance I would find it hard to attend. As I'm sure you understand I don't think it's good for me to keep on remembering. It is, however, very good for me to keep demanding that this government treat the British public with the respect that we deserve and practice the democratic morals which they are so fond of preaching to the rest of the world. Holly: It was said in jest, thus the emoticon.
" hey....we missed you!...next time x"
you caught me fresh from a conspiraloon confab...my defenses were up!